I love chocolate. So much so that I'm always looking for a new chocolate recipe. This is my newest addition that I think you'll enjoy. 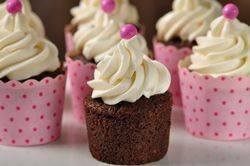 It pairs a moist and chocolately cupcake with a soft and fluffy Marshmallow Buttercream Frosting. So let's talk about how these cupcakes get their wonderful chocolate flavor. We actually use two types of chocolate; unsweetened dark chocolate and unsweetened cocoa powder. Unsweetened chocolate is also known as baking or bitter chocolate and it's chocolate in its rawest form. While you wouldn't want to eat it on its own because it doesn't contain sugar so it has a strong bitter flavor, it is perfect for providing a rich chocolate flavor in these cupcakes. We are also adding a little unsweetened cocoa powder and you can use either Dutch-processed (alkalized) or natural unsweetened. The chocolate and cocoa powder are first dissolved in boiling water and this is to melt the chocolate and to bring out the cocoa powder's full flavor. The frosting for these cupcakes is a Marshmallow Buttercream Frosting. This soft and fluffy frosting is really a Confectioners Frosting to which we add a jar of store bought marshmallow cream (or fluff). The marshmallow cream adds a deliciously sweet flavor and light and fluffy texture to the frosting. Now, Marshmallow Creme or Fluff is a thick, soft and fluffy, very sweet marshmallow flavored mixture that is made from corn syrup, sugar syrup, dried egg whites, and vanillin. It can be found in most grocery stores and is sold in either jars or tubs. Chocolate Cupcakes: Preheat your oven to 350 degrees F (180 degrees C) and place the oven rack in the center of the oven. Line a 12 cup muffin pan with paper liners. Or you can butter or spray the muffin cups with a non stick vegetable spray. In a heatproof bowl, place the unsweetened chocolate and cocoa powder. Pour the boiling water over the chocolate and cocoa powder and stir until the mixture is melted and smooth. Set aside to cool to room temperature while you make the batter. In the bowl of your electric stand mixer, fitted with the paddle attachment (or with a hand mixer), beat the butter until smooth. Add the sugar and continue beating until the mixture is soft and fluffy (about three minutes). Add the eggs, one at a time, beating well after each addition. Scrape down the sides and bowl of the bowl as needed. Add the vanilla extract and melted chocolate mixture and beat to combine. With the mixer on low speed, alternately add the flour mixture (in three additions) and milk (in two additions), beginning and ending with the flour. Beat only until the ingredients are incorporated. Fill the muffin cups about 2/3 full, and bake for about 18 minutes, or until a toothpick inserted into the center of a cupcake comes out clean. Remove from oven and place on a wire rack to cool about 5 minutes before removing the cupcakes from the pan to finish cooling. Bake the remaining cupcakes. Marshmallow Buttercream Frosting: In the bowl of your electric stand mixer, fitted with the paddle attachment (or with a hand mixer), beat the butter until smooth. Beat in the vanilla extract and marshmallow creme. With the mixer on low speed, beat in the sugar. Scrape down the sides and bottom of the bowl as needed. Then, on high speed, beat the frosting until it is light and fluffy (about 3-5 minutes). If necessary, add a little cream or confectioners sugar to get the right piping consistency. Pipe (I used a Wilton 1M star tip) or spread the frosting on each cupcake. Makes about 18 regular-sized cupcakes.